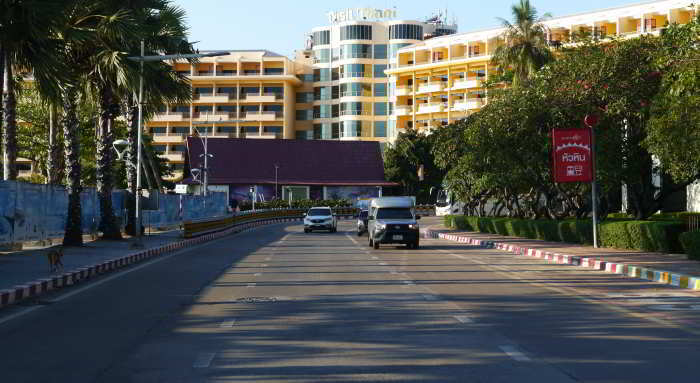 Pattaya Beach Road starts before the entrance to Walking Street and continues approximately 2.8 kilometers before heading east away from the beach at the Dusit Thani Hotel and continuing a further 340 meters towards the Dolphin Roundabout. 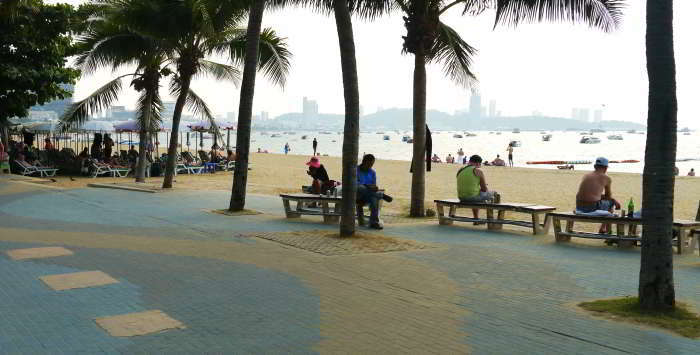 Beach Road runs parallel to Pattaya Beach almost the entire length of the beach – except for the northern most length of the beach in front of the Dusit Thani. Besides access to Pattaya Beach and the promenade footpath along the entire length of Beach Road – there many hotels, bars, restaurants, convenience stores and gift shops along the entire length of the road. Just as you would expect at any major seaside resort town. 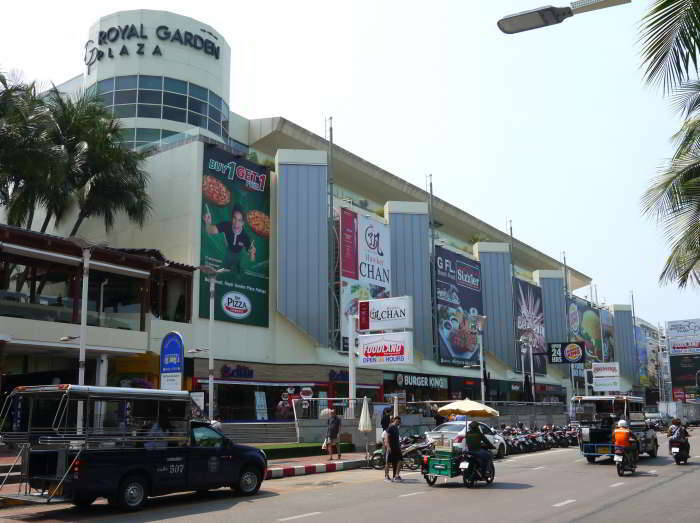 The combination of access to major shopping malls such as Central Festival Beach Mall, Royal Garden Plaza, and some of Pattaya’s largest hotels – along with popular nightlife venues and restaurants mean Pattaya Beach Road and the beach are very much the main focal point of Pattaya City. Of all the beachfront hotels in Pattaya the Dusit Thani is the hotel with direct access to Pattaya Beach, but there are hotels on Pattaya Beach Road – including the Hilton, Amari, Holiday Inn and the Markland – which have rooms with amazing views of the ocean and Pattaya Bay. 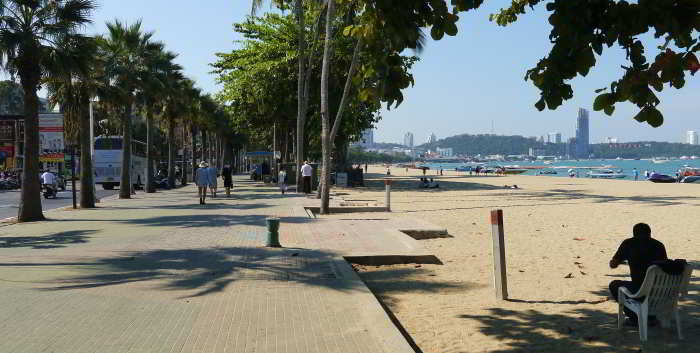 Pattaya Beach Road and its numerous sois (streets) connecting Beach Road to 2nd Road is one of the most convenient and popular places to stay in Pattaya. Besides high rise hotels there are sprawling resorts such as the Avani and the Bayview. There’s also lots of budget priced 2 and 3 star hotels and guest houses, especially on soi’s 7, 8, 10, 13 and 13/2. If you’re looking for a convenient location to take a family holiday in Pattaya, some of the best family friendly hotels in Pattaya are actually right on Pattaya Beach Road. What is thought to be the first proper hotel – and the location of the first bar and discotheque in Pattaya – the Basaya Beach hotel, formerly known as Nipa Lodge is also located on Pattaya Beach Road. As is the Tahitian Queen – the first go-go bar in Pattaya. 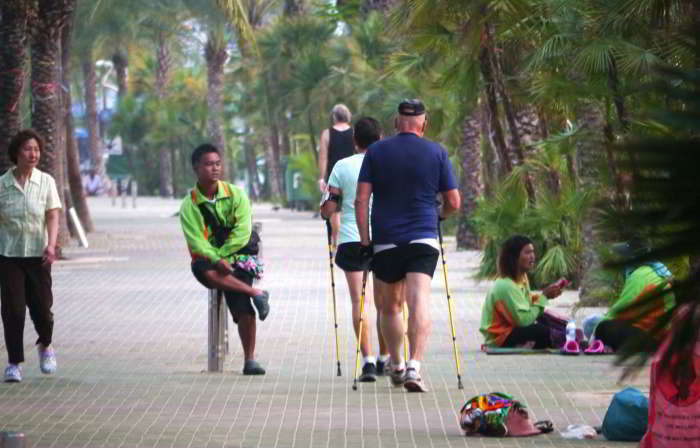 Pattaya Beach’s wide – palm tree lined promenade footpath is a popular place to chill out and watch life go by, take an early morning or afternoon stroll, or go for a jog. Although you would only notice it if you were a single man – the promenade is often frequented by freelance working girls looking for business, for which it has become known locally as the Coconut Bar. The sois – between Beach Road and 2nd are very popular nightlife venues, but there are also bars and beer bar complexes right on Beach Road which are popular by day and night. 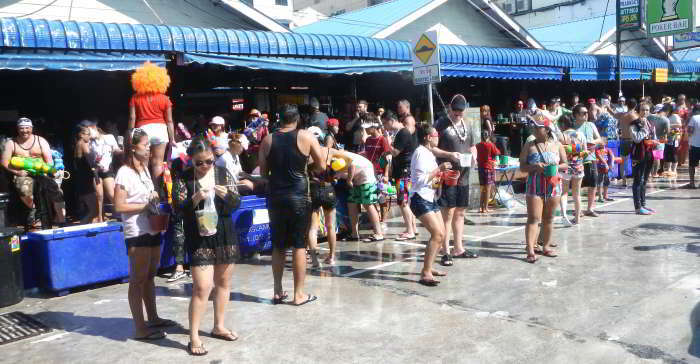 Most bars are located between Central Pattaya Road (klang) and South Pattaya Road (tai). Some of the most popular bars on Beach Road are Lovely Corner on the corner of Soi 7 and Beach Road, Poppy 2, Lucky Star and Red Cat bar on the corner of Beach Road and Soi 8, and Best Friend Bar. Along with Bali Hai and Lan Pho public park in Naklua – Pattaya Beach Road is a popular venue for staging, celebrating, and spectating major events and festivals in Pattaya. 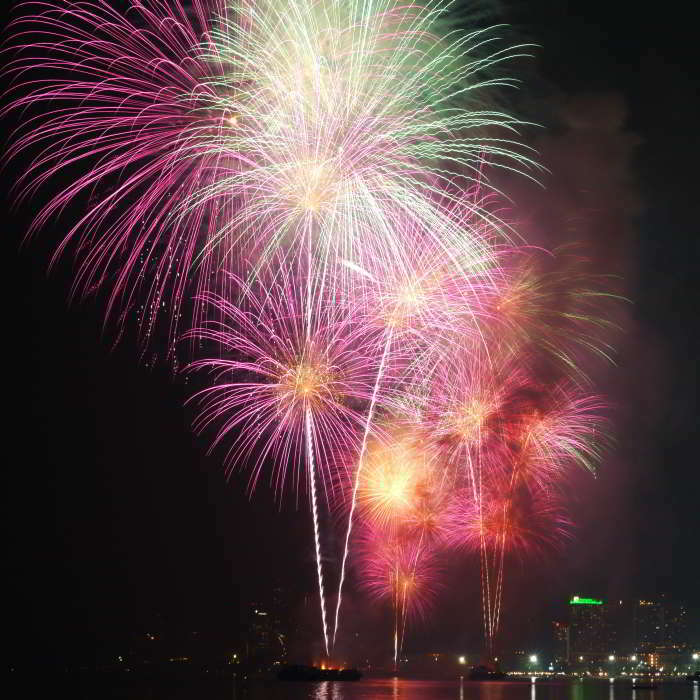 Some of the major events and festivals on Pattaya Beach Road include Songkran, Pattaya Marathon, Loy Kratong, New Year celebrations and fireworks, International Fireworks Display, St. Patrick’s Day Parade and Pattaya Bed Race. In most cases Pattaya Beach Road will be closed to traffic, and major events like Songkran will be accompanied by live music performances. For some events such as the Vegetarian Festival there is also usually an array of food stalls assembled on the promenade. 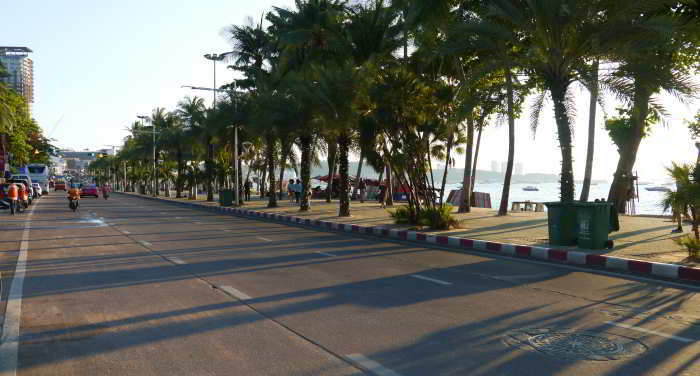 Pattaya Beach Road has a lot going for it. It’s right on the baht bus route which makes it easy to get around Pattaya. There’s hotels and all types of accommodation to suit every budget, from cheap guest houses to 5 star resorts. There’s easy access to Pattaya Beach, great dining options, nightlife, Children’s activities at Central Festival Beach mall and Royal Garden Plaza. No matter what you are visiting Pattaya for, Pattaya Beach Road is absolutely one of the best places to stay in Pattaya.